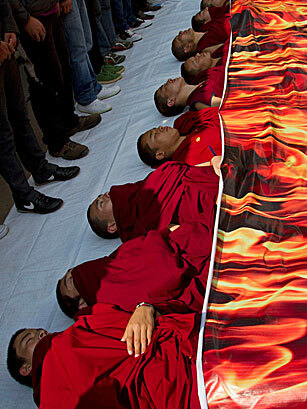 Tibetan Buddhist monks lie under a banner showing flames during a political enactment depicting immolations in Tibet, in Dharmsala, India, Wednesday, Nov. 2, 2011. It usually takes a U.S. President tweaking Beijing by meeting with the Dalai Lama, or a celebrity-studded Richard Gere fundraiser, to get Tibet into the news these days. Even then, the attention is fleeting. Not so the despair of many Tibetans at their plight under Chinese rule, now in its seventh decade. TIME's Hannah Beech sneaked into Twu in eastern Tibet earlier this year to report one of the most gripping stories out of the region in years: At least eight Tibetan monks, two of them teenagers, have torched themselves this year to protest Chinese rule. Self-immolation is an old and horrifying form of protest that Americans first saw on television during the Vietnam War, and which touched off Tunisia's democratic uprising and the wider 'Arab Spring' earlier this year. Its emergence among Buddhist monks in Tibet illustrates what Beech called a "new, nihilistic desperation [that] has descended on the Tibetan plateau." Despite the efforts of the Chinese authorities to quickly dispose of the bodies in the hope of heading off further protest, Beech wrote, "Monks on fire grab headlines." Hopefully, more attention will be paid.